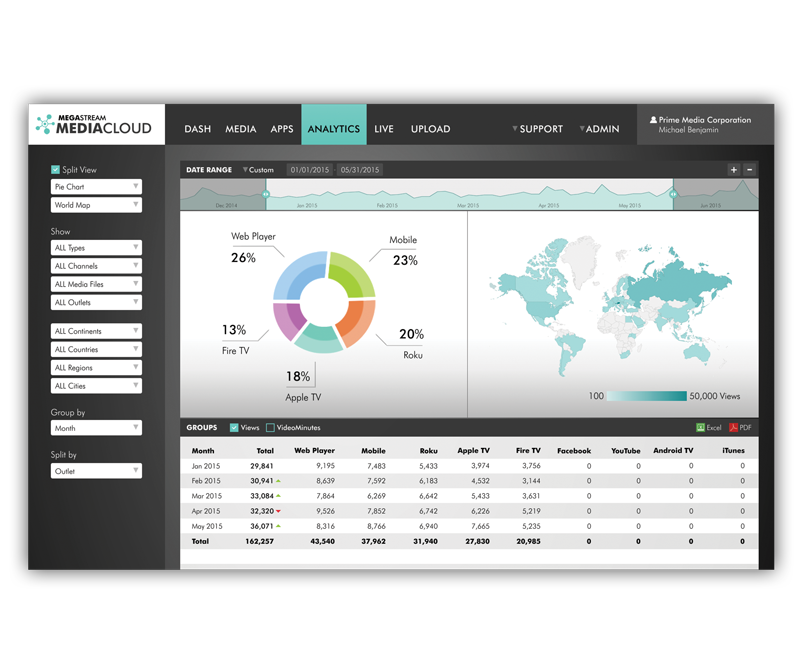 Track your viewership in real-time! Watch who is viewing your content from where – which country, state, city – how long, on which device, which channel, which video, which live-stream. Know your viewership, detect trends and track your popularity in order to continuously optimize your strategies. No viewing stats are more reliable than the ones recorded by the actual servers which deliver the content to the viewer. All viewing activity is recorded in a variety of independent instances in our global CDN: on the nodes, origin shields, central storage and on the devices of end-users who give us instant feedback on views, viewing time and type of device. Our CDN nodes therefore can pinpoint where each viewer is located, how often and how long he connects with a device to the second. Want to optimize marketing strategies and track user behavior inside your mobile apps, web apps, social apps or TV apps? Whether it is Google Universal Analytics or Conviva – our app developers will integrate custom tracking services per your requirement.